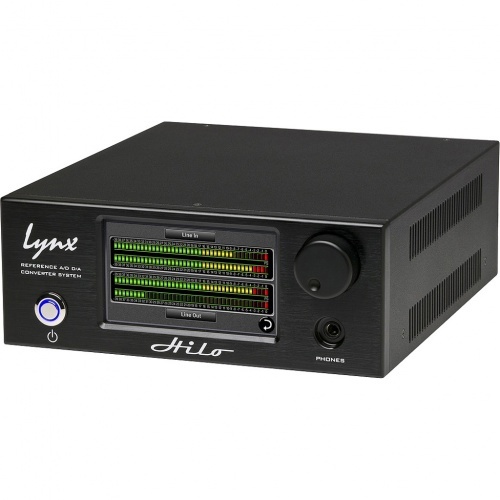 The Lynx Hilo Reference ADDA Converter System redefines and reengineers the two-channel converter system. With pristine audio, independent headphone section, innovative touch screen control and monitoring, Hilo sets the new standard for the two-channel converter. Lynx Studio Technology is proud to present the Hilo Reference ADDA Converter System. 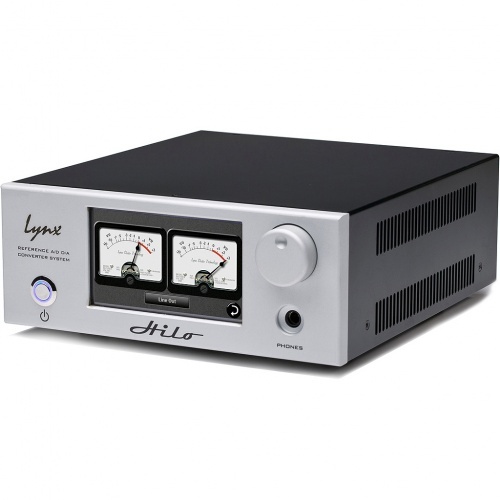 With the pristine, open, transparent audio quality for which Lynx is known, Hilo (pronounced HE-low) provides two channels of mastering quality analogue to digital conversion, up to eight channels of digital to analogue conversion, a secondary monitor output, and a world class independent headphone amplifier in a compact half-rack size. A first for the two-channel pro converter market, Hilo’s innovative 480 x 272 touch screen provides a flexible and intuitive interface that can adapt to a particular application and be easily upgraded with enhancements and new features. Initial front panel controls support extensive signal routing and mixing, sample rate selection, clock source options, levels, metering and diagnostic features. Hilo completely redefines and evolves the category of the two-channel converter. Of utmost importance is the audio signal quality. The completely new design of the analogue stages and converter topology for Hilo break new ground in terms of lowering distortion and noise while maintaining transparency for A/D and D/A conversion. Beyond that, Hilo offers extensive I/O capabilities and utilizes the latest FPGA technology with vast resources for control, routing, and signal processing capabilities. Also in development are diagnostic and analysis tools for Hilo. The LCD screen is a natural interface for these functions! 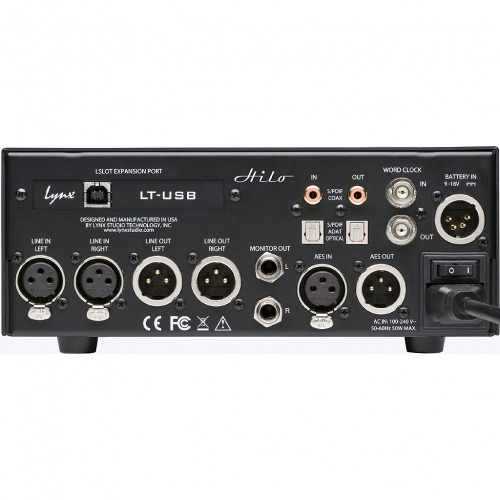 The digital or analogue inputs can be routed to three separate outputs, Line Output (with 8 trim settings), Monitor Output, and Headphone Output. Each of these output pairs has its own dedicated DACs, allowing each to offer a unique mix. The Monitor and Headphone Outputs have volume controls, accessible via faders on the touch screen or the single knob on the front (offering control in ½ dB increments). Another innovation, the Headphone section has its own dedicated D/A converter. In total, Hilo has 12 total inputs, 16 total outputs, plus 32 channels possible via its LSlot port. The unit’s FPGA powers its internal 32-channel mixer, which allows Hilo to offer the most versatile I/O and routing in the two-channel converter genre. This is just the beginning of the innovation. In contrast to the concentrated and intricate back panel, Hilo’s front panel is elegant in its simplicity. It has a power switch, headphone jack, multipurpose control and a 480 x 272 pixel high resolution LCD touch screen. This high-resolution screen does a lot more than simply replace the buttons on the front panel of most other converters. Of course it handles the basic settings and routing functions, clocking and level settings. A second meter screen shows just two larger bar-graph style stereo bar meters. Any input or output set can be assigned to each meter. In addition to bar-graph meters common on most converters, Hilo’s touch screen is able to show traditional metering types such the old style VU metering. Also in development are diagnostic screens, such as real time analyser, phase meter and loudness meter. As with all other Lynx products, Hilo is FPGA based, meaning new features, capabilities and graphics can be added at any time with a simple download.